Roads, Trains, Tracks Under Water? 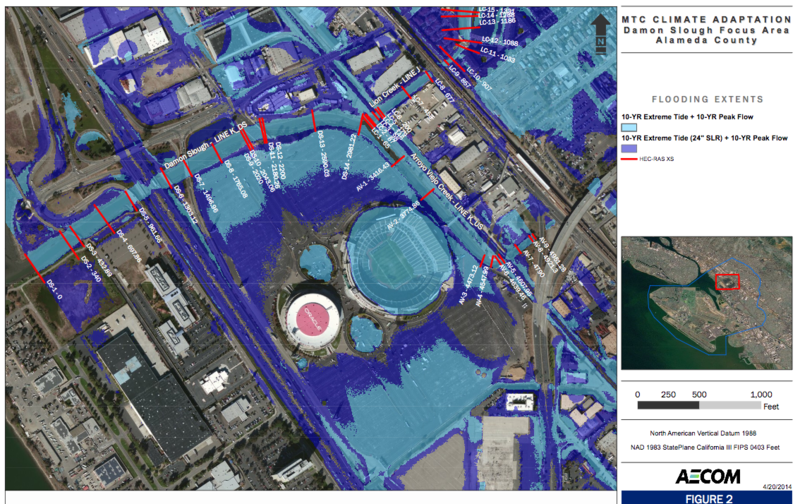 Residents aren’t the only ones who will feel the pain of future sea level rise in the Coliseum area. Key portions of the Bay Area’s transportation network thread through this low-lying area. 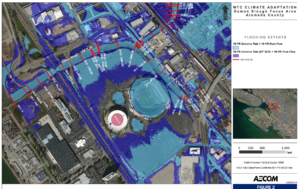 According to a 2014 study commissioned by the Metropolitan Transportation Commission, those traveling via BART, Amtrak, local roads, and Interstate 880 will all get caught by extreme tides combined with creeks overtopping from big storms and rising groundwater levels. At this confluence of multiple creeks, the Bay, and transportation arteries, roughly half of the area will be sloshing under one to two feet of water (blue shading), while an additional 25 percent will suffer more than two feet of flooding (purple shading) once sea level rises two feet higher than today.